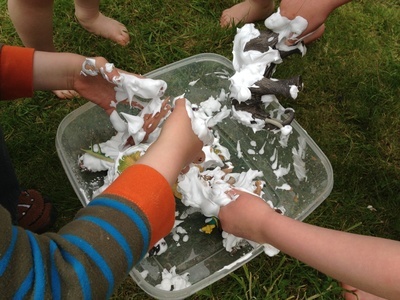 When it comes to kids and mess, something so simple can be so much fun. 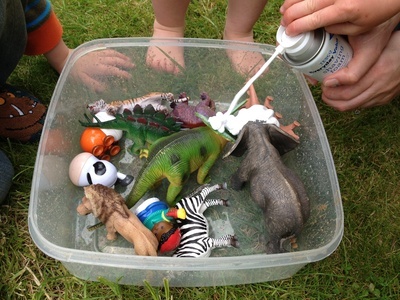 This foam dinosaur hunt is cheap and easy to set up but will keep them occupied for longer than you could imagine. It also makes a great group activity. My two kids love dinosaurs and have lots of plastic ones but you could use anything you like from small waterproof toys to kitchen spoons. 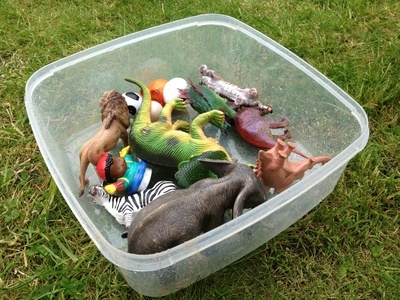 Fill a plastic box with dinosaur toys. My boys liked helping me with this stage and were curious about what we were going to do. A few jungle animals make it in too. 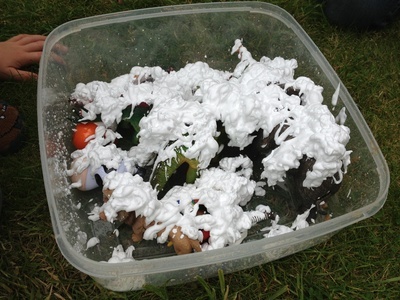 Shake a cheap can of shaving foam and then spray all over the toys. Stand back and let your kids get stuck in. My boys and their cousins had a great time out in the garden with this activity. They also liked adding water and sand to the box which extended the game for longer. I am amazed at this creative idea! What fun for small children.